​The topic of lifts comes up fairly regularly at Kaffeeklatsch and on the Facebook page. 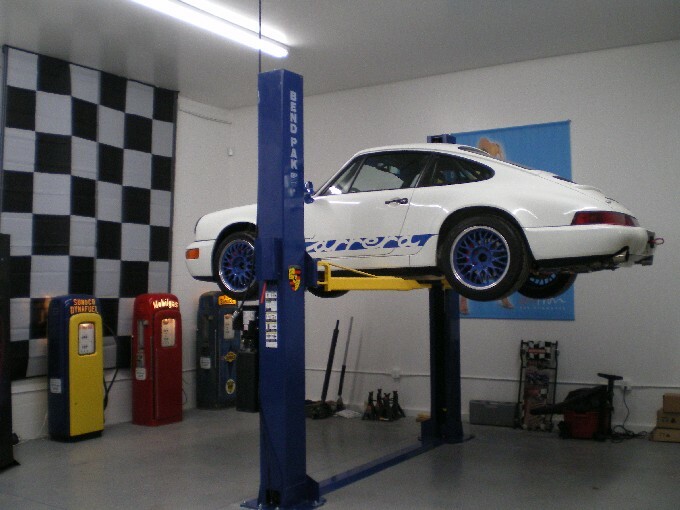 I for one would love to have a two post lift in my garage, but alas, the ceiling height of my garage precludes it. If you have been hatching the idea in the back of your brain, hopefully this primer will help you a little bit in narrowing down the type of lift that would work for you. The first thing to consider in choosing the type of lift you would like is the primary purpose you wish to achieve. Most I’ve talked to are primarily interested in increasing their indoor storage area. They have a two car garage, but have 3 cars. A lift can solve that issue for you. The secondary feature most want is the ability to service their car themselves. For me, my primary interest was servicing the car, not storing one. So, let’s look at the different types of lifts and their pros and cons. ​This lift is most suitable for car storage. It allows the vehicle to be driven onto two runways and lifted by its tires. This allows the car to rest on its suspension, as opposed to its jack points, which for long term storage is preferable. This type of lift also exposes the underside of the vehicle, allowing servicing of the engine and drive train. 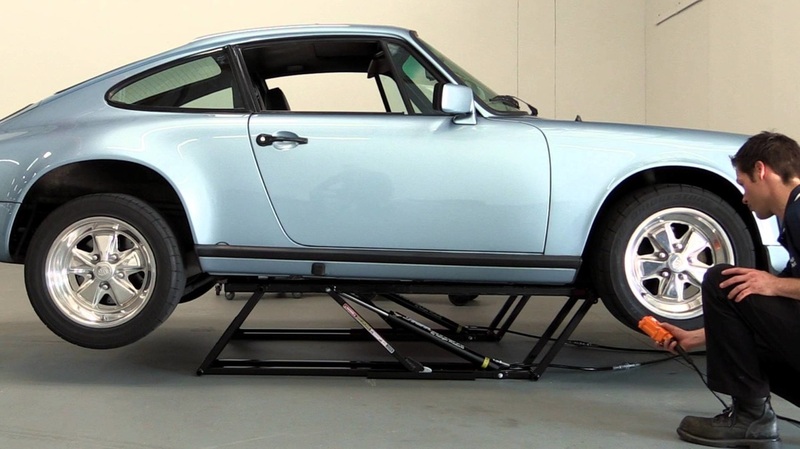 The downside of this type of lift is any work involving the wheels/tires/suspension requires an additional jack to lift the vehicle off of the runways and depending on the size of the lift, the posts may limit easy access to all four tires at once. ​If your primary interest is servicing your vehicle, then this is the lift for you. This is the type of lift you’ll see at most service shops as they provide almost unlimited access to the undercarriage of the vehicle and tires. One of the downsides of the two post lift is that in most standard residential garages, the positioning of the post that would be adjacent to the second vehicle in the garage can make the opening and closing of the driver’s door at risk of hitting the post and navigating between the parked cars and post is also inconvenient. The two post lift also requires thickened concrete at the post locations, which will typically not exist in a residential garage. This means the old concrete would have to be cut out and new, deeper concrete poured. ​The single post lift is offered in two different configurations. One using runways and the other using jack points. I seem to recall that some companies offer a runway option for their jack point lift, but I could not find one in my internet search. If you are aware of one, please comment below! The single post lift is a great option for modern garages in that the post can be positioned against a wall, eliminating the issue of the two post (and four post for that matter!) of having a post (or posts) in the middle of the garage. The downside of the lift is the legs that provide support for the lift extend out from the single post and must be driven over each time you park in the garage. Depending on the height of your car, you may not make it over the hump! ​There are several types of scissors lifts. We will look at two here. The first option is a single unit that would typically be permanently located in your garage that you can drive over. It will raise your car at the lift points. It allows easy access to tires and suspension, and to the engine of front or rear engine cars. But you mid-engine guys are out of luck! 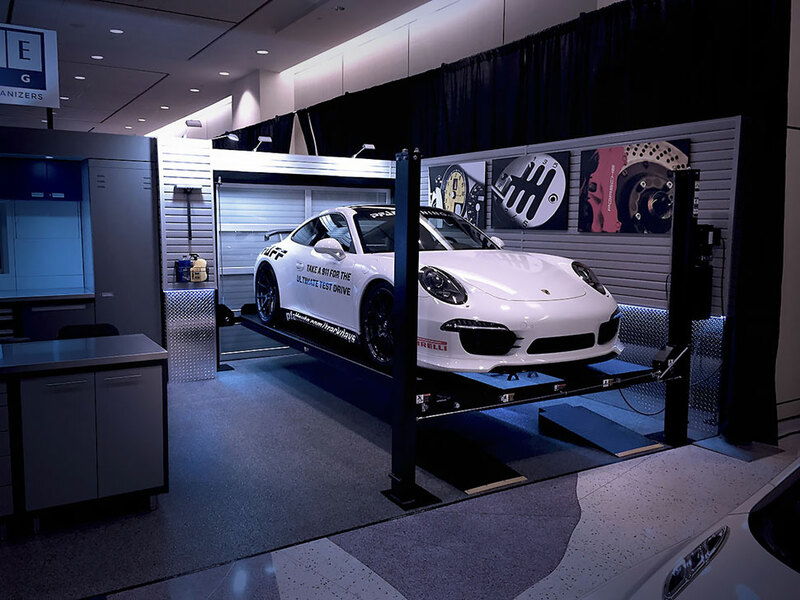 This lift cannot be used for car storage, but is an excellent choice for track monkeys who are changing tires and brakes frequently. 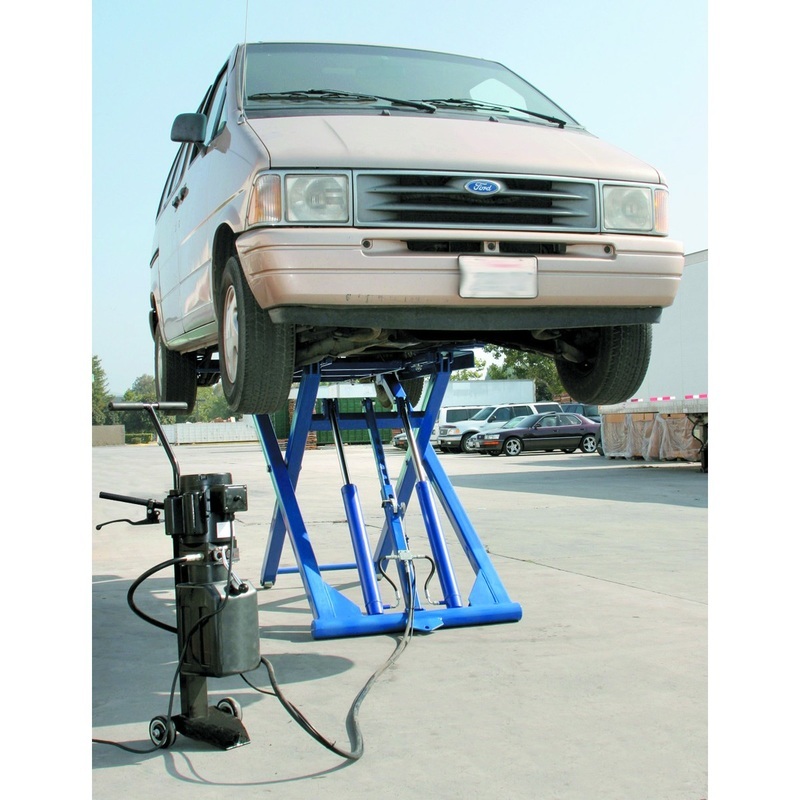 It is also passable for oil changes, although the more compact versions only lift 55” or so. The second type of scissors is a split and portable type. Each side is positioned under the jack points for the car to be lifted. Once lowered, each side can be removed or slid to the center for storage. These are very handy and several club members have them and like the portability and small footprint. In addition to the purchasing of the lift, you must install it. Depending on the type of lift, that can be very easy (scissors lift) to very complicated (2 post). Several of us in the club helped install a two post in the garage of a friend. This is a job that requires several people and several hours to accomplish. Another consideration is power. Most lifts require 220v power, so you will need to add a 220v outlet in the vicinity of where the hydraulic unit will be located. 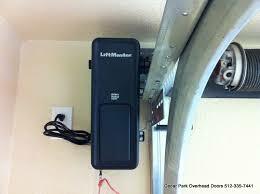 If your breaker panel is in your garage, that makes the task easier. 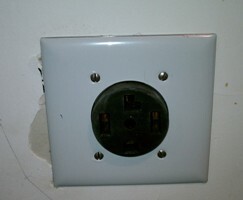 Otherwise, you could incur a significant expense in having the outlet added. The final consideration is the garage door itself. 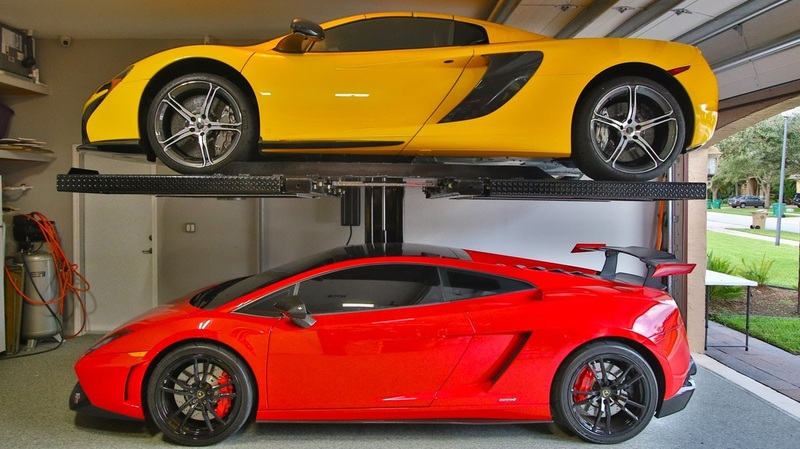 Most garages will require the garage to be re-tracked to the top of the garage, allowing space for the lifted car. 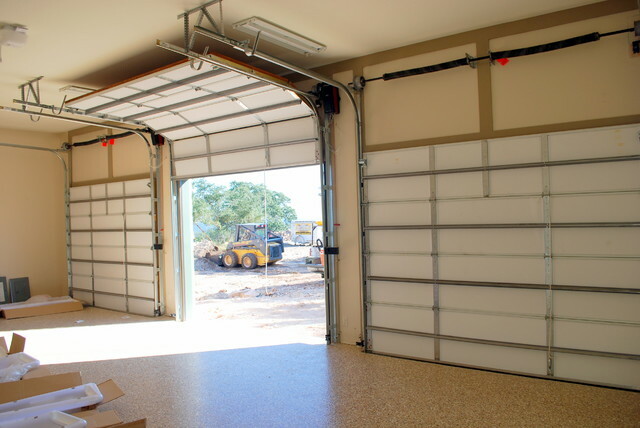 Once the door is re-tracked, conventional garage door openers may not be able to lift the door and a jack shaft opener will need to be installed. This also will require the addition of an electrical outlet at the location of the opener and the rerouting of the garage door button wire and door sensors. So, that it! I’m sure I missed a lot of information so feel free to comment below! If you have a lift, please share with your fellow club members the type, manufacturer, pros and cost, and price (if you’re willing). Everyone (I hope!) on this site knows that slower traffic is supposed to keep right and the left lane is only used for passing. But what about the center lane? Until recently, I did the painful commute from Chapel Hill to Cary down I-40 and often found myself camping out in the center lane. With all of the on-ramps, I was constantly moving over from the right lane to the center lane to allow oncoming traffic to merge onto the highway. Or I was changing to the center lane to pass people who believe you are supposed to start slowing for an off-ramp approximately a mile before the exit. 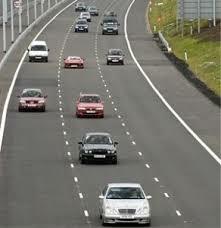 So, There I found myself, camping in the center lane. What are YOUR thoughts on center lane campers? Let me know in the comments below! I've got to say, I was thrilled to be elected Vice President of the Hurricane Region. What an awesome honor!! Being the first two-time recipient of the Golden Clamp award... not so much. No, I jest. I am truly honored to be recognized by the club for not only burying an engine under my parent's deck in 1981, but also driving off from a gas pump with the nozzle still in the filler; although my car catching on fire is the much more popular activity to receive ribbing about (especially from Chris Saba!). But enough of that! I have just returned from the Porsche Southpoint Grand Opening. And what a gala affair it was! Not only were there many cars there from Bob Ingram's collection, there was a staff of incredibly nice and receptive people there to greet us. 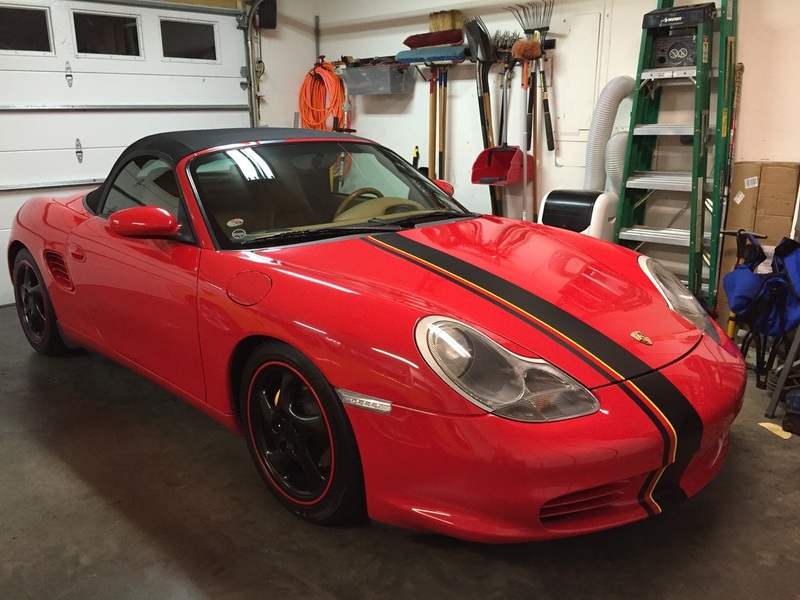 But there is one gentleman in particular I wanted to mention: Brian is a new service technician who joined the Porsche Southpoint team just two weeks ago and who has only been working on Porsches for about a year, having been a Maserati and Ferrari tech previously. Tasked with manning the door to the shop during the grand event, Brian didn't get to see any of the festivities happening "front of house", but he undertook his task with aplomb and took time to talk to my son, Grant, about the alignment he had recently performed on our '03 Boxster, patiently explaining the issues he encountered with the alignment. Brian is extremely friendly and personable and I am glad I had the opportunity to get to know him better. So, thanks Porsche Southpoint for that, lots of good wine and food, the enjoyable company of your staff, and most importantly, parking Yellowbird right out front for all to see!! !